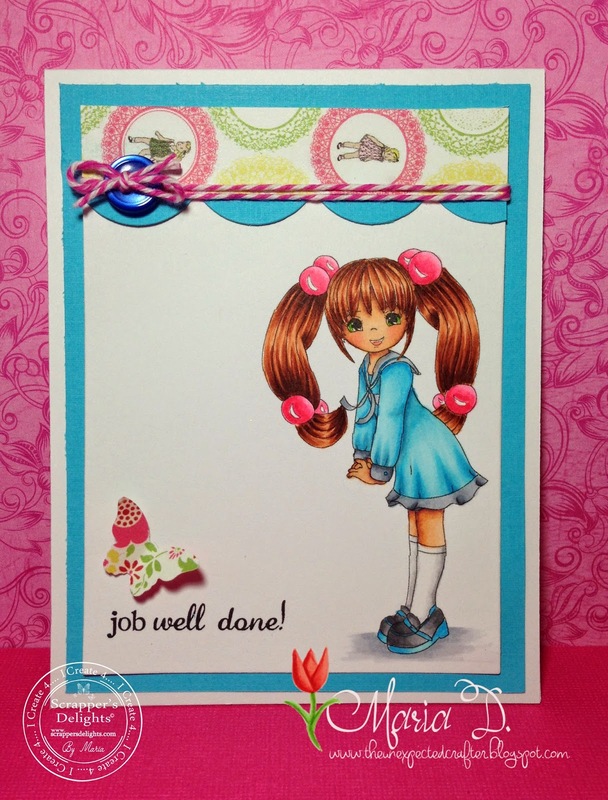 Today is the start of a new challenge at Scrapper's Delights and I decided to work with this fab image: School Megan! The new challenge is Cute and Girly. I colored the image using Copic Sketch markers. I love this image, it's so versatile and fun and it can't get any more cute and girly than that!! I used a variety of cardstock and scrapbook paper but you can find beautiful papers also sold at Scrapper's Delights. You can find lots of papers to choose from. Click on the image and you will be directed to the store site. Please pop over to the blog to see what the rest of the design team have created and don't forget to join the Scrapper's Delights Fan Page on Facebook and Pinterest. I hope you like what I have created and it inspires you to join in with us too! Don't forget that you could be the winner of 3 digi images from Scrapper's Delights! Such a wonderful creation with great attention to detail. Love the colours and embellishments. All the elements work so well together. It is perfect for our tenth ‘ANYTHING GOES’ challenge. Thanks for sharing your talent with us. Good luck. Lovely card Maria. Your colouring is awesome. Thank you for sharing with us at Copic Marker Spain. Good luck.